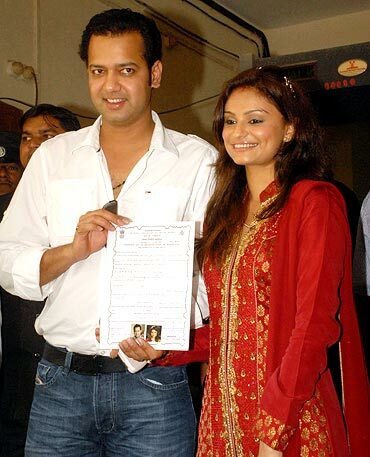 Rahul Mahajan and his wife Dimpy Ganguly display their marriage certificate after collecting it from the BMC office in Mumbai on Tuesday. The three witnesses that signed the marriage registration are Sameer Nair CEO, Imagine, Sazila Alana, from Sol Production and Ausuja Sayed Mohammed, Rahul's manager. Rahul married Dimpy on NDTV Imagine's show Rahul Dulhaniya Le Jayega on March 6. 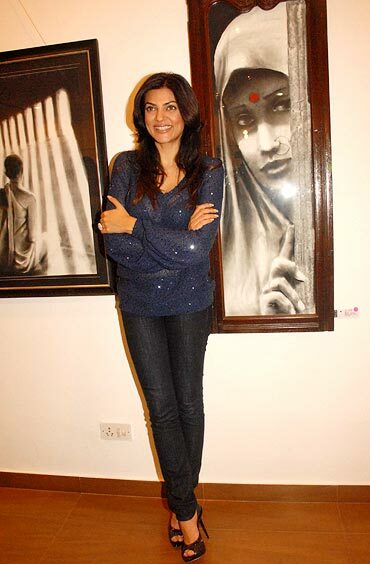 Also in Mumbai, Sushmita Sen is spotted at the opening of Gautam Patole's exhibition of charcoal paintings. Charlize Theron is spotted at a game of the NBA Western Conference playoff series between the Los Angeles Lakers and the Oklahoma City Thunder in Los Angeles. Zoe Saldana poses at the premiere of the movie The Losers at the Grauman's Chinese theatre in Hollywood. Pix: When growing a beard matters!